Reckless Gardener catches up with designer Paul Stone as he puts the finishing touches to one of the two feature gardens celebrating BBC2’s Gardeners’ World 50th anniversary at the NEC. Gardeners’ World Live (NEC, Birmingham, 15th-18th June 2017) will be celebrating the 50th anniversary of BBC2’s Gardeners’ World with two feature gardens this year. 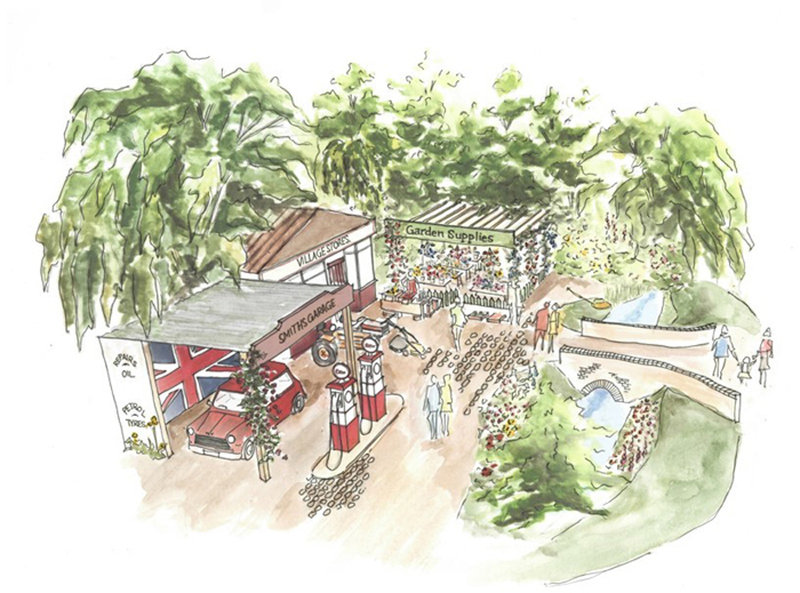 One of them ‘The Nostalgia Garden’ designed by Paul Stone will take us back to the swinging sixties when the iconic BBC2 programme launched. 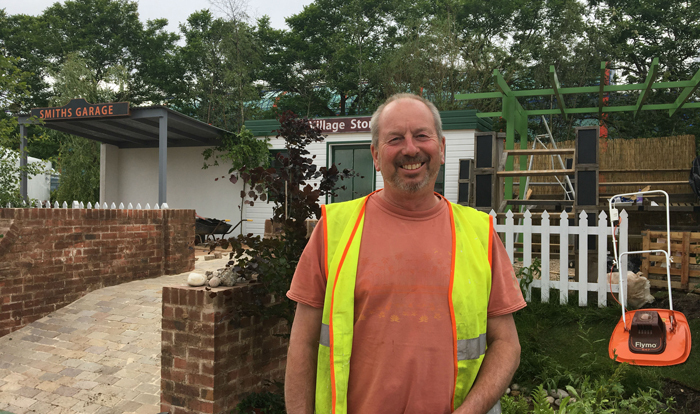 Last year Paul designed a show-stopping garden with his barge in a canal setting and for this special anniversary garden he has chosen a design that the public can walk through depicting a village scene typical of the period. We asked Paul (pictured left) what plants, typical of the era he will be using on the garden: “I’ve looked at horticulture in the late 60s and what traditional nurserymen were mainly selling such as produce and field grown plants, seasonally,” he said. “Post-war austerity was giving way to new home owners with money to spend on their gardens. I’ve a top ten list of plants sold in that period, which includes some basic favourites like Roses, Rhododendron and Berberis. Current favourites are far more Mediterranean like Cordyline, Trachelospermum and Convolvulus. I will be showing all these for comparison,” he explains. The Show garden incorporates a nursery and Paul points out that visitors will be able to see how the plants were actually sold during that period – bedding in newspaper from wooden seed trays and shrubs in cans for example – plastic pots were in their infancy. Creating a walk-through garden is always popular with show-goers because they can get closer to the plants but there are lots of added considerations and challenges for a designer who chooses to incorporate this in a design: “Obviously safe access and egress are critical and surfaces with non-slip texture are required,” he explains. “Also consideration to somehow protecting the plants from the close attention of the public. Another challenge is the garden fills with people and it’s hard to see it as single piece of work but I love trying to closely connect people to plants and it’s exciting for them to get into a show garden rather than feel excluded from it.” I think we would all agree with that. 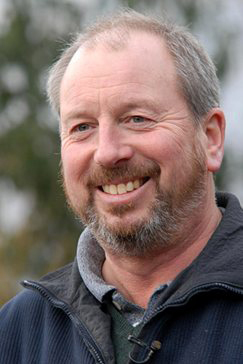 Paul has also had the privilege of having a key role in delivering the landscape at the Eden Project since the early days in 1999. He confesses that he is a British tree and shrub person really, but since living in Cornwall has been fascinated with half-hardy plants like Agapanthus, Palms and wonderful herbaceous plants like Geranium Maderense (Maderia Cranesbill). The Nostalgia garden incorporates a garage and fuel pumps with a classic 1960s Mini Cooper, the first Flymo mower (you can see this in the picture above) was sold 50 years ago and one can be seen on the riverbank of the garden and a garden supplies nursery selling all the plants that would have been available in the 60s.